En la bienal de Venecia que pronto cerrará sus puertas hay una maravillosa y revolucionaria instalación de Adrian Piper. Es maravillosa y revolucionaria porque a mi modesto entender pretende cambiar el mundo, y cambiarlo a uno mejor. A simple vista la instalación no llama mucho la atención. Hay tres mostradores tipo recepción de empresa grande. En la pared detrás de cada mostrador hay una frase en letras doradas: “Siempre haré lo que digo que haré”, “Siempre irá en serio lo que digo”, “Siempre seré demasiado car@ para ser comprad@”. En los mostradores, los visitantes pueden firmar un contrato en el que se comprometen a cumplir cada una de estas promesas. Elige uno, dos o tres. Comprométete. Cambiemos el mundo. The Probable Trust Registry: The Rules of the Game #1-3, 2013-15. 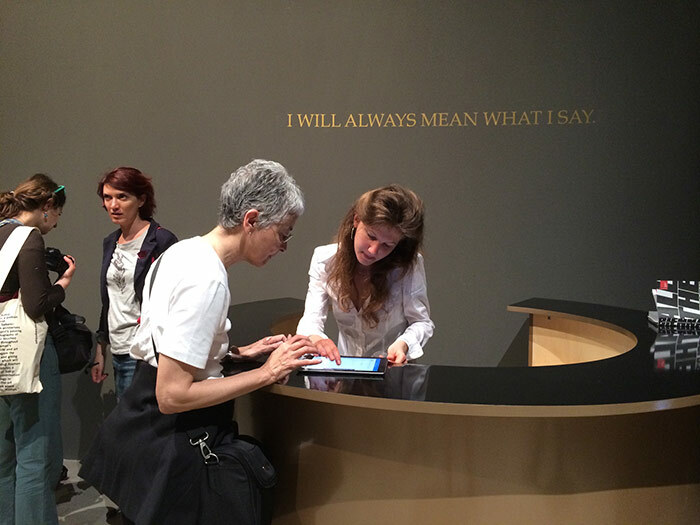 Installation + Participatory Group Performance: three embossed gold vinyl wall texts, each 7,0 cm H, each affixed to 70% slate grey floor-to-ceiling wall at 2,0 m H; three circular gold reception desks, each 1,83 m D x 1,6 m H, each with chair, each centered in front of wall and below text; A4 format contracts; signatories’ contact data registry; administrator; self-selected members of the public. Detail: The Rules of the Game #1, 2013. #13001.1. Venice Biennale installation, Arsenale Gallery 5. Collection Adrian Piper Research Archive Foundation. © APRA Foundation Berlin. The Probable Trust Registry: The Rules of the Game #1-3, 2013-15. 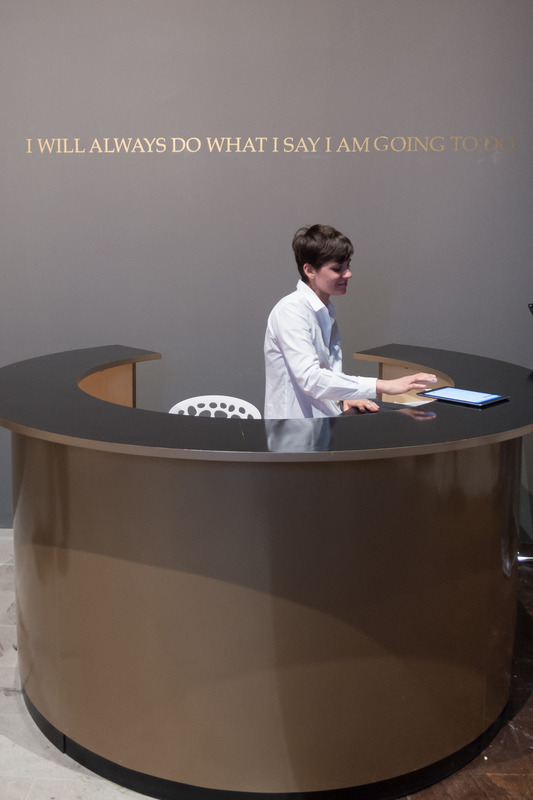 Installation + Participatory Group Performance: three embossed gold vinyl wall texts, each 7,0 cm H, each affixed to 70% slate grey floor-to-ceiling wall at 2,0 m H; three circular gold reception desks, each 1,83 m D x 1,6 m H, each with chair, each centered in front of wall and below text; A4 format contracts; signatories’ contact data registry; administrator; self-selected members of the public. Detail: The Rules of the Game #2, 2013. #13001.2. Venice Biennale installation, Arsenale Gallery 5. Collection Adrian Piper Research Archive Foundation. © APRA Foundation Berlin. The Probable Trust Registry: The Rules of the Game #1-3, 2013-15. 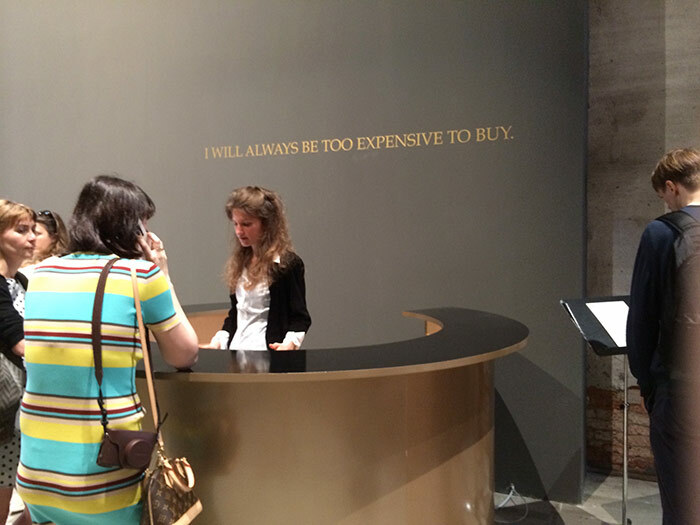 Installation + Participatory Group Performance: three embossed gold vinyl wall texts, each 7,0 cm H, each affixed to 70% slate grey floor-to-ceiling wall at 2,0 m H; three circular gold reception desks, each 1,83 m D x 1,6 m H, each with chair, each centered in front of wall and below text; A4 format contracts; signatories’ contact data registry; administrator; self-selected members of the public. Detail: The Rules of the Game #3, 2013. #13001.3. Venice Biennale installation, Arsenale Gallery 5. Collection Adrian Piper Research Archive Foundation. © APRA Foundation Berlin.